Bleach Safe towels 16X26 at very competitive low price from Towel Super Center. These towels are available in size 16x26 and are excellent for hair salons and other businesses looking for color safe towels. 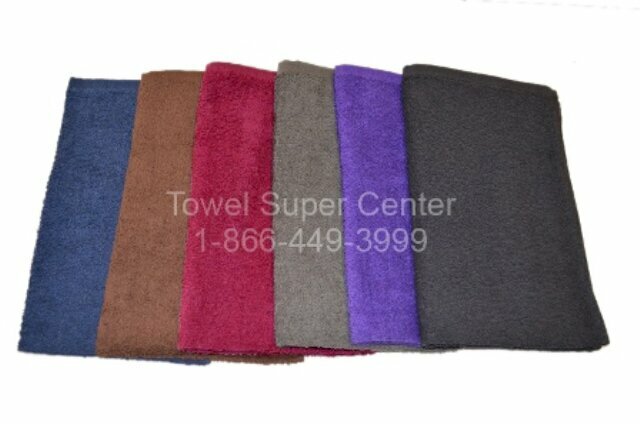 You want hand towels with strong colors for your nail salon, gym, health club, hotel or home. However, you worry: Will they start to fade or spot? It's a common issue, unless you get bleach-safe hand towels from Towel Super Center. Our incredibly soft and absorbent bleach-safe hand towels are ideal for professional, commercial and personal use. Choose from several perfect hues, including black and burgundy, and never worry they will be damaged by a bleach spill. Although no hand towels can prevent all "oopsie" moments, these do a phenomenal job of resisting even concentrated bleach spills. The more bleach-resistant hand towels you order, the deeper your discount. At a perfect dimension of 16-by-26 inches, they give you consistent comfort and complete peace of mind. With Towel Super Center, you get economical shipping and fantastic towels at an amazing price. Have you ever noticed that one of your hand towels is getting spots or splotches? This type of spotting or fading occurs because the cotton towel has not been specially treated. Consequently, when it encounters products you use daily, the color begins to leave the fibers. These bleach-resistant hand towels make it much less likely to see any shade discoloration in the long term because they have been created to withstand occurrences like accidental bleach spills or mixing a colored hand towel in with a bleached-white wash load. Aside from bleach itself, many hand towel users discover that hygiene and health items can cause nasty stains on their towels. For instance, some popular anti-acne treatments and creams contain ingredients that work well on the skin, but can leave hand towels looking less than inviting. Additionally, hair dyes that get on regular towels, even for a few moments, can leave tiny splotches. The only way to prevent yourself from having to constantly purchase new hand towels is to always opt for bleach-resistant hand towel varieties. With tons of great colors to choose from, you'll never have to worry that your hand towels will soon be turned into rags. Do you lose anything by purchasing a bleach safe-hand towel instead of a regular 100 percent cotton one? Not at all! In fact, you won't know the difference in touch or appearance. We're very proud of the hand towels and other products we sell at Towel Super Center. Each item is carefully evaluated before we add it to our curated catalog of options. This allows you to confidently order anything from our site and have it shipped to your door quickly. If you've been looking for a bleach-resistant hand towel that feels cuddly but holds up under normal wear and tear, you've found your match. Place your order right away so you don't miss any opportunities to use these great towels for yourself or your clientele.